What was more entertaining Saturday? Watching the scores of Major Routs in college football or the NFL Cuts pertaining to former big name collegiate quarterbacks? Here is a list of the routs and then I'll talk about the quarterbacks. 1. Ohio State manhandles Buffalo 40-20. 2. Oregon blasted Nicholls State 66-3. 3. Texas A&M routs Rice 52-31. 4. Notre Dame trounces Temple 28-6. 5. Oklahoma crushes LA-Monroe 34-0. 6. Wisconsin massacres Massachusetts 45-0. 7. UCLA pounds Nevada 58-20. 8. Washington waxes Boise State 38-6. 9. Michigan clobbers Central Michigan 59-9. 10. Texas tramples New Mexico State 56-7. 11. Florida drills Toledo 24-6. 12. Alabama mauls Virginia Tech 35-10. Just because you've won a National Championship or are a former Heisman Trophy Winner doesn't mean you'll be a great quarterback. There were other big name quarterbacks that also got pink slips on Saturday. Some have found new jobs either on the active roster or on the practice squad. Some teams have opted to keep just two signal callers and figure that these quarterbacks will be available if there is a major injury. 1. Tim Tebow, 26, won a National Championship and a Heisman Trophy. He is now a free agent after the New England Patriots released him. I see an outside shot that he returns to New England if there is an injury. His only hope is Offensive Coordinator Josh McDaniels. 2. Rusty Smith, who is pictured, is the best QB in FAU History. He was cut by the Tennessee Titans but was re-signed and will be on the team's practice squad. 3. Vince Young was released by Green Bay and is a free agent. Once a National Championship QB for the Texas Longhorns now that's a distant memory as he struggles to find a home in the pros after being released by the Tennessee Titans in 2010. 4. Matt Leinart won a National Championship and a Heisman Trophy with the USC Trojans. He is a free agent and was recently cut by the Buffalo Bills. 5. 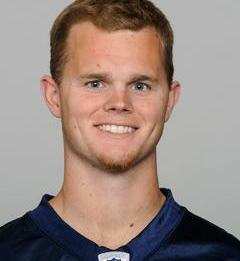 Jimmy Clausen was a heralded signal caller at Notre Dame and was expected to be a starter for the Carolina Panthers. That was before Cam Newton arrived in Charlotte. Now he's available to all 32 teams. 6. Greg McElroy won a National Championship at Alabama. He leaped ahead of Tebow on the depth chart to start a couple games last season. His criticism of the Jets locker room and conflicts with Coach Rex Ryan along with an ankle injury has him looking for work. 7. Jordan Palmer is the younger brother of Carson Palmer. He was cut Saturday by the Chicago Bears and I'll be curious to see where he lands. His brother Carson plays for the Arizona Cardinals. 8. Trent Edwards was also cut by the Chicago Bears Saturday. Since his departure from the Buffalo Bills in 2010, he's been with the Jacksonville Jaguars (2010), Oakland Raiders (2011), Philadelphia Eagles (2012) and the Bears. With the Bills lacking an experienced backup signal caller, I'm surprised that they don't call him. He could make a phone call to his former Stanford Coach Jim Harbaugh. Age 29 isn't too old to land a spot. 9. Dennis Dixon signed a two-year contract with the Philadelphia Eagles on February 14, 2013 to be reunited with his collegiate Offensive Coordinator Chip Kelly. Despite the Oregon connection, Dixon didn't make the Eagles final roster and is a free agent. 10. Brady Quinn had a fine career at Notre Dame but he's bounced around the NFL. When Seattle released him on August 31, the New York Jets wasted no time adding him to their roster as a back-up to rookie Geno Smith, when they inked him on September 2, 2012. New York released Graham Harrell on September 2, 2013 after signing with the Jets on August 28, 2013. No time for Harrell, the former Texas Tech standout, to get a cup of coffee and bagel in Manhattan. 11. David Carr was the No.1 pick for the first-year Houston Texans in 2002 and was the first player ever selected by the franchise. He collected a Super Bowl Ring as the backup signal caller behind Eli Manning with the New York Giants. At age 34, I have a feeling that he'll get another job if an injury occurs. Right now, he's just a victim of the two QB's numbers game. 12. Seneca Wallace deserves frequent flyer miles this year. After Seattle Coach Mike Holmgren drafted him as a fourth round draft choice out of Iowa State in 2003, he's had an interesting journey to his current spot. He followed Holmgren to Cleveland in 2010 and stayed until 2012. In 2013, Wallace has been with the New Orleans Saints and San Francisco 49'ers this off-season. On September 2, 2013, he signed with the Green Bay Packers to backup Aaron Rodgers. There is no doubt that the Packers figure to use his knowledge in their opener against the 49'ers.